After waiting more than thirteen years for the U.S. to meet its offer to update Taiwan’s aged submarine force, Taipei recently announced plans to develop its own submarines locally. Taiwan’s willingness to assume a greater share of its defense is laudable. But Taipei has no experience building these complex vessels, and it is falling further behind China’s growing military power. It should thus acquire them sooner and more cheaply from Tokyo, with Washington openly contributing to blunt Beijing’s retaliation. If the U.S. and Japan refuse to strengthen Taiwan’s defensive capabilities, China will infer that its willingness to take Taiwan outweighs other nations’ readiness to stop it. That calculus would heighten the risk of a cross-Strait conflict, and raise doubts about Washington’s willingness to defend its other regional partners as China presses them in the East and South China Seas. Submarines are valuable to Taiwan, even if they will not swing the China-Taiwan military balance in its favor. China, only 100 miles from Taiwan, threatens forcible unification. Modern Taiwanese submarines offer an asymmetric response, particularly because China’s anti-submarine capabilities are deficient. For instance, these vessels could contest a Chinese maritime blockade and attack Beijing’s amphibious vessels if China tries to invade the island by sea. Yet Taiwan fields a small, antiquated submarine force: two were acquired from the Netherlands in the 1980s and its remaining pair (used solely for training) was built in the 1940s. Taipei has long-requested international assistance to modernize its submarines. In 2001, Washington authorized its purchase of eight diesel submarines. But that agreement remains unfulfilled because the U.S. stopped constructing such vessels in the 1950s (it uses nuclear-powered models) and had ceased operating them by 1990. That left Germany, Japan, and the Netherlands with the required expertise. Until this past April, however, Tokyo followed a self-imposed ban on exporting its weapons. And the Europeans balked for fear of sparking Chinese retaliation, as occurred after the Dutch sold Taiwan submarines in the 1980s. Lacking international support and facing an increasingly powerful and assertive China, Taiwan recently announced plans to domestically design and build four to eight diesel submarines. This move would create jobs in Taiwan and reduce its dependence on foreign arms suppliers subject to Chinese pressure to limit their defense ties to Taipei. Still, if Taiwan is set on acquiring submarines (some argue that its budget constraints necessitate other weapon purchases), it should secure them abroad. Because Taiwan has never built a submarine, constructing its own will likely cost more ($820 million per submarine), take substantially longer to complete (a prototype may be finished by 2024, with a few more years needed beyond that to commission a boat), limit interoperability with other countries’ militaries, and yield inferior vessels compared to procuring them from an experienced source (for example, Japan can build its most advanced diesel submarine in four years for about $500 million). Given that Beijing’s military spending far exceeds Taipei’s and Taiwan estimates that within six years, China will be able to invade it while repelling a U.S. intervention, Taiwan cannot afford to waste money or time while beefing up its defenses. 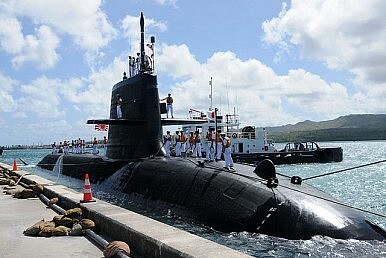 Japan should build Taiwan’s submarines, which will deepen their growing ties and benefit both countries. Tokyo has extensive experience constructing some of the world’s best diesel submarines, which Japan can now export. Indeed, Australia will likely purchase up to ten diesel submarines from it. Although Tokyo would have to sell Taipei less advanced models because Beijing regularly steals Taipei’s military secrets, Taiwan could potentially benefit from the economies of scale created by a combined Australian-Taiwanese order of similar submarines. Building the Taiwanese units would help boost Japan’s sagging economy and could bolster domestic support for Tokyo’s military normalization efforts. And because China and Japan are competitors, Tokyo’s strategic interests favor strengthening Taiwan so it does not become a Chinese foothold only 65 miles from Japan and near sea lanes through which Japan’s trade and energy imports pass. Japan may hesitate to help Taiwan. At least cosmetically, the Chinese-Japanese rivalry has cooled of late, and more improvements are planned. But the proposed submarine sale would almost certainly reverse this progress. Moreover, Beijing is Tokyo’s largest trade partner, and their trade is projected to grow for the first time in three years. Japan’s weakened economy thus makes it keen to avoid Chinese countermeasures. The danger of Beijing waging economic warfare against Tokyo is real. For example, in 2010, following Japan’s detention of a Chinese fisherman caught in disputed waters, Beijing cut Japan’s rare earth exports – elements that China almost wholly controls and which are used in most cutting-edge technology. And after Japan nationalized islands in 2012 that are also claimed by China, its exports to China dropped nearly 14 percent the following year due to a Chinese boycott of Japanese goods. Washington must therefore openly participate in Taipei’s submarine procurement, such as by subsidizing the purchases or providing the vessels’ weapons and radar. Beijing is more likely to limit its reprisal if the targets are its most serious military rivals and two of its largest trading partners and sources of foreign direct investment. Indeed, China’s leaders maintain domestic control by improving their citizens’ living standards. But the Chinese economy has slowed and may continue to do so, making Beijing wary of conflicts that could further stymie its wealth creation. Additionally, China may curb its response for fear of encouraging presidential and legislative election victories in 2016 for Taiwan’s chief opposition party (the DPP), which opposes unification more strongly than the island’s ruling party (the KMT). Beijing is already sensitive to this risk given that Taiwan’s pro-China president has low approval ratings, the KMT just suffered heavy losses in municipal elections, including in longtime strongholds Taipei and Taichung, with the DPP securing the most victories, hundreds of thousands of Taiwanese recently protested against a trade deal with China, and Taipei has closely studied Beijing curtailing Hong Kong’s democracy. But even if China will not temper its response (because, for instance, the nationalist backlash there would be too great), the proposed submarine sale should still go ahead. If Taipei is left to develop its own vessels, conflict in the Taiwan Strait will be more likely. China views weapons sales to Taiwan as a test of the U.S.-led security order in Asia. After all, if the U.S. and its partners will not bolster Taiwan’s lagging defensive capabilities for fear of upsetting China, they appear unlikely to stand by Taipei in a battle with Beijing. China would read this outcome as confirming its growing ability to diminish America’s other regional defense guarantees and reflecting limitations on Japan’s nascent military normalization efforts. A weaker Taiwan ostensibly backed by wavering partners will thus invite Chinese aggression in the Taiwan Strait and beyond. More broadly, China will have noted America’s willingness to let domestic lobbyists’ narrow interests stall a free trade agreement that would empower China’s rivals, failure to enforce threats made against Syria’s president, conflict-fatigued voters, defense cuts, inability to disengage from the crisis-plagued Middle East, and reliance on largely symbolic punishments for Chinese and Russian power grabs. It now questions whether the U.S. can and will maintain a meaningful global force posture and employ it (plus non-military tools like the Trans-Pacific Partnership) decisively when necessary. Absent such American support, China would deem its neighbors more compliant and extending its control easier. As long as it appears that Taiwan has strong backers, cross-Strait peace is more likely. Washington and Tokyo must therefore help Taipei acquire modern submarines. Inaction will increase Beijing’s confidence that it can both keep Washington sidelined as it grows stronger and more assertive and convince its neighbors that American security guarantees are empty. Paul J. Leaf worked on defense issues for a think tank. He is a regular commentator on U.S. foreign policy and an attorney at an international law firm. As Washington debates overseas engagement, it must not forget about Taiwan.